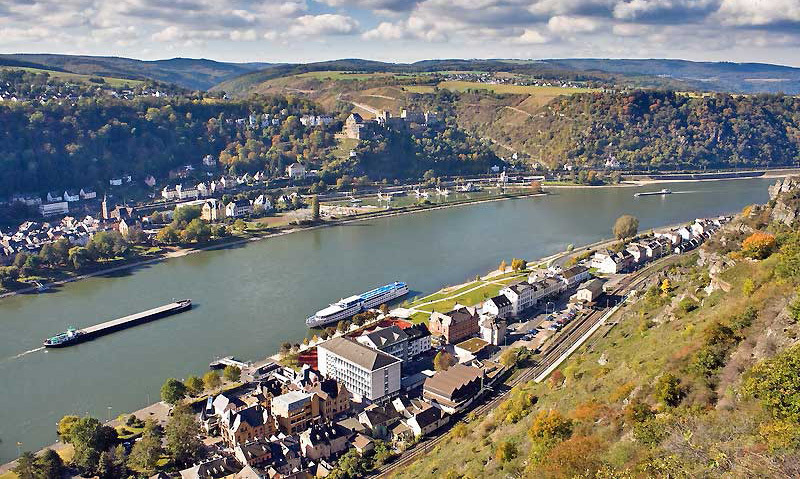 The Upper Middle Rhine extends from Rüdesheim through to Koblenz. The Rhine River here is called the the Romantic Rhine. 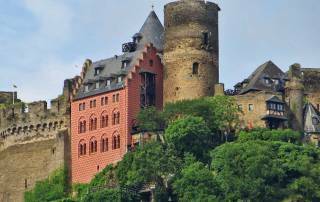 UNESCO has designated the Romantic Rhine as a World Heritage Site. 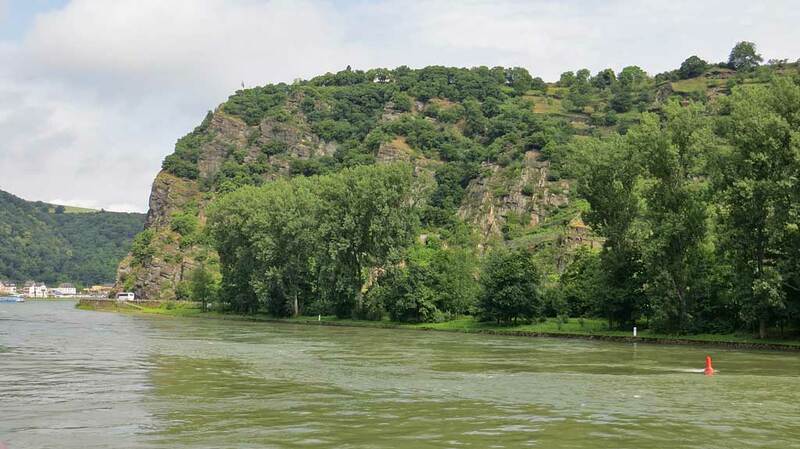 This is the most scenic section of the Rhine River. The Romantic Rhine is famous for its castles (“burg” in German). 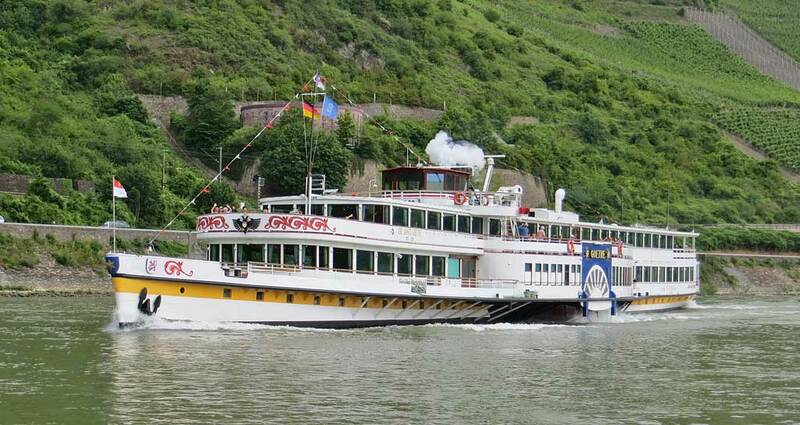 Major river cruise lines and local day cruise operators send many boats through this section of the Rhine River. The height of the tourist season and good weather is in August, but spring and fall may be more enjoyable with lower numbers of tourists. 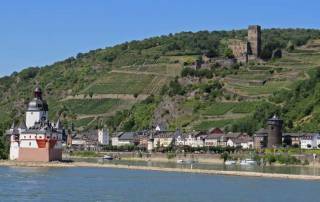 You can get to the Romantic Rhine on a train to Koblenz or Rüdesheim and then take a local river cruise. 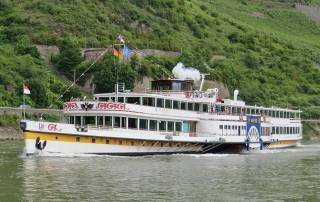 KD (Koln Dusseldorfer) operates trips on the Romantic Rhine throughout the year. 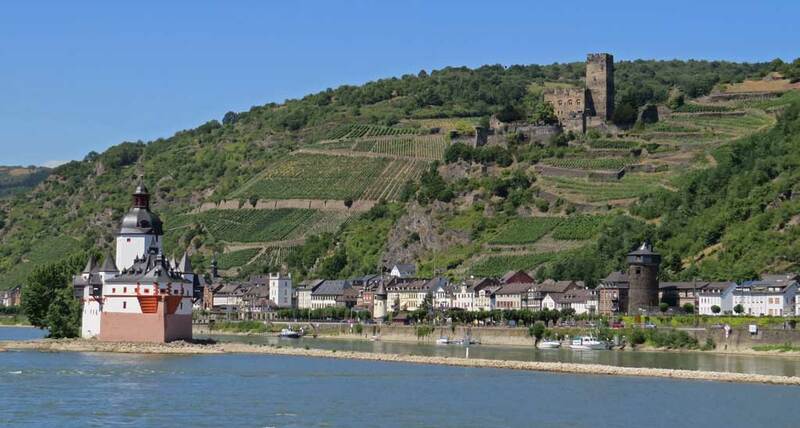 It’s best to start in Rüdesheim and then cruise to Koblenz, because the river flow makes the trip several hours shorter in this direction You should expect to spend 4 hours traveling downstream from Rüdesheim. 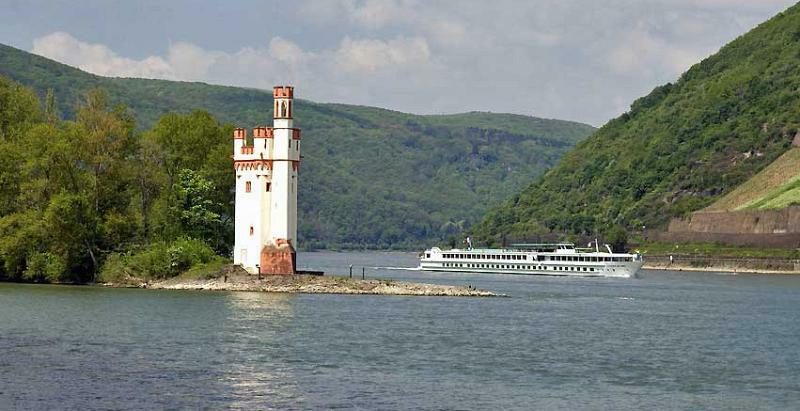 Another option is Bingen-Rudesheimer, which cruises the Romantic Rhine between Rüdesheim and St Goar. You can also get to the Romantic Rhine on a longer Rhine River Cruise, because Rhine River Cruises always travel this section of the river during the daytime. 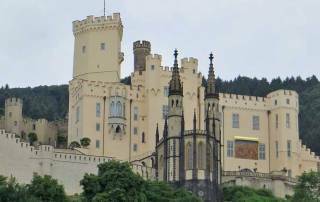 True castle lovers may prefer to get to the Romantic Rhine by car. That way you can travel up and down both sides of the Rhine River. You can also easily castle hop by car. Many of the castles are open to public tours. Several castles allow overnight stays. 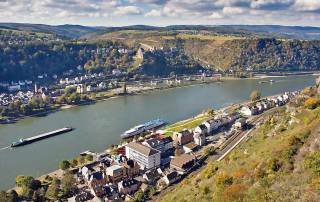 Make sure to plan your route, as there are no bridges across the Rhine River along the Romantic Rhine. 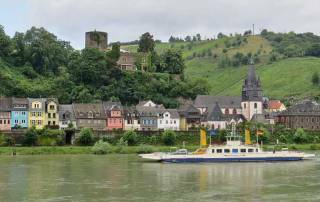 You can cross the Rhine River along the Romantic Rhine on a passenger ferry at Km Marker 584 between Stolzenfels and Lahnstein. 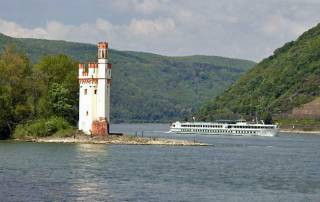 There is a passenger ferry from from Kaub to the island fortress of Pfalzgrafenstein too. 527 – The town of Rüdesheim. 529 – Der Binger Mauseturm (the Mouse Tower) was a tax collection station in the 1200s. It’s located on an island in the Rhine. 530 – Ehrenfels Castle is in ruins. It was built in the 1200s for defensive purposes. Ehrenfelser wine is named after it. 533 – Rheinstein Castle is a family owned structure from the 1200s that is open daily for tours. 534 – Reichenstein Castle is also known as Falkenburg. It was built in the 1200s and is open to the public. It has a working drawbridge. 538 – Sooneck Castle was built in the 1200s and is open to the public. 540 – Heimburg is a castle situated right in the riverside town of Niederheimbach. It is not open to the public. 543 – Jugendherberge Burg Stahleck Castle at the town of Bacharach is open to the public. 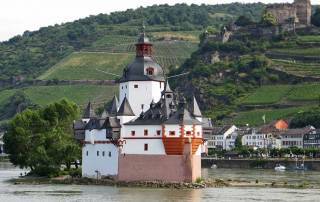 545 – Pfalzgrafenstein Castle is a former toll both on an island in the Rhine. Get there by passenger ferry. 545 – Gutenfels Castle was open to the public as a hotel until 2006 when it became privately owned. 546 – Castle Hotel Auf Schönburg at Oberwesel welcomes overnight visitors. 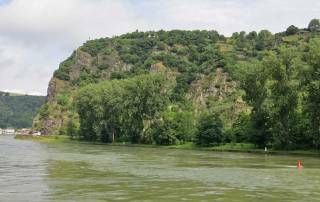 554 – The Lorelei (Loreley) is an historically treacherous river bend at the Loreley rock near St. Goarshausen. Legend has it that Lorelei committed suicide here and her spirit distracts sailors with a sound that leads to shipwrecks. 556 – Katz Castle at St Goarshausen was built in the 1300s and is currently privately owned. 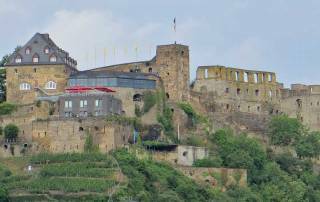 557 – Rheinfels Castle at St Goar was started in 1245 and is the largest castle on the Rhine Gorge. It is open to the public. 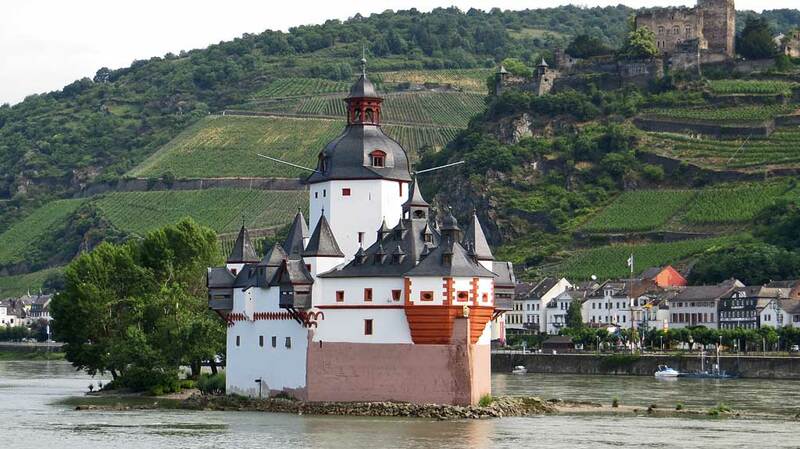 559 – Maus Castle, on the St Goarshausen side of the Rhine was built in 1356. 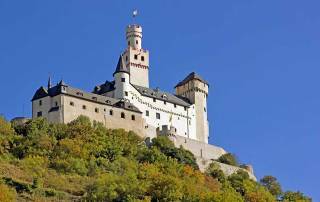 567 – Sterrenberg & Liebenstein Castles are also referred to as the Hostile Brothers due to the feud between the two siblings that resulted in the construction of a wall between the castles so the brothers wouldn’t see each other. The Liebenstein Castle has been a family run hotel since 1995. 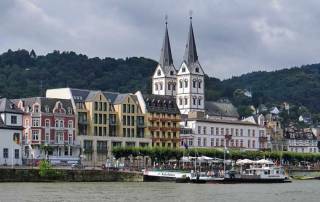 570 – The town of Boppard. 580 – Marksburg Castle at Braubach was started in the 1100s and is the most popular tourist destination on the Romantic Rhine. 585 – Lahneck Castle was built in 1226 and is privately owned. There is currently no public access. Stolzenfels Castle is across the river from Lahneck Castle. It was built in the 1200s and is distinctive for its white color and for its church located in front of its fortress walls. 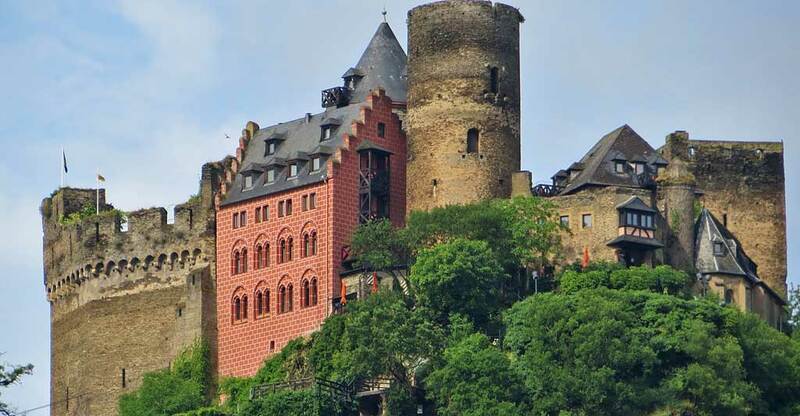 This castle is open to the public and is a popular destination due to its beauty and its proximity to Koblenz. 590 – The city of Koblenz.